James Herriot. Herriot, James, photograph. AP Images. James Herriot was the pen name of James Alfred Wight, a veterinarian who practiced in northern England. He began writing about his experiences with animals at the age of fifty, becoming one of Britain's most successful authors. 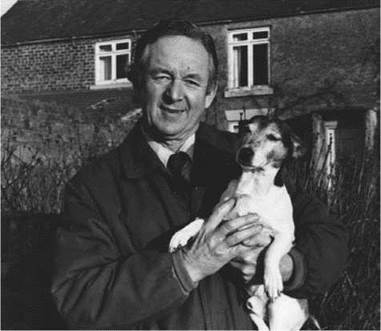 Gentle, humorous, and heartwarming, Herriot's books, such as his first best-seller All Creatures Great and Small, include reminiscences about his life and career: relationships with family and colleagues, his animal patients, the farmers who owned them, and the Yorkshire countryside. After reading a magazine article describing a veterinarian's life, Herriot decided at the age of thirteen that he wanted to be a vet. After receiving his degree from Glasgow Veterinary School, Herriot started his first job as an assistant vet in North Yorkshire, England, in the practice of Dr. John Sinclair. ‘‘I hadn’t thought it possible that I could spend all my days in a high, clean-blown land where the scent of grass or trees was never far away... [and] find the freshness of growing things hidden somewhere in the cold clasp of the wind.... My work consisted now of driving from farm to farm across the roof of England with a growing conviction that I was a privileged person.’’ Thirty years later, the work and the countryside would become the focal points of his books. Bright and Beautiful Success. After four years of improving his writing skills and enduring publishers’ rejections, Herriot saw the 1970 publication of If Only They Could Talk in England. By itself the book sold only twelve hundred copies, but this number did not accurately predict the career about to unfold. ‘‘I thought it would stop at one book and nobody would ever discover the identity of the obscure veterinary surgeon who had scribbled his experiences in snatched moments of spare time,’’ Herriot wrote in James Herriot’s Yorkshire. His next book, however, eliminated the possibility of his fading into obscurity. It Shouldn’t Happen to a Vet was published in the United States together with If Only They Could Talk under the title All Creatures Great and Small. The book was an instant best seller. It proved to be his most popular book and launched a series that included All Things Bright and Beautiful, All Things Wise and Wonderful, The Lord God Made Them All, and Every Living Thing. Every volume was met with great enthusiasm. The Last ‘‘Big’’ Book. In 1984, Herriot expanded his writing to include children’s stories with Moses the Kitten, the first of several cat stories written for young readers. Dogs have received equal billing in books including The Market Square Dog (1991) and James Herriot’s Dog Stories (1995), in which many of the pieces were adapted from his previous works. Although Herriot had told Foster and others that The Lord God Made Them All would be his last ‘‘big’’ book, he relented, and Every Living Thing was published in 1992, on the twentieth anniversary of the release of All Creatures Great and Small. The book was a best seller. Among the reviews expressing delight, Cathy Collison of the Detroit Eree Press remarked that the book ‘‘offers more of Herriot’s personal life,’’ and concluded that it ‘‘is enough to keep the reader hoping Herriot, now retired from surgery, will turn his hand to one more volume.’’ Unfortunately for his admirers, Every Living Thing was to be Herriot’s last original book. Heinrich Boll (1917-1985): This German author is respected for his post-World War II writings as much as for his successful resistance to join the Hitler Youth movement. Ella Fitzgerald (1917-1996): African American ''First Lady of Song,'' Fitzgerald is considered one of the most influential jazz singers of the twentieth century. Anthony Hopkins (1937-): This Academy Awardwinning Welsh actor has portrayed many fine gentlemen throughout his career, but he is popularly known for playing the cannibalistic Hannibal Lecter in The Silence of the Lambs. Walter Farley (1915-1989): Farley was the original author of the immensely popular Black Stallion series. Ted Hughes (1930-1998): Hughes was a British poet whose work often uses animals as metaphors. Born Free (1960), a nonfiction work by Joy Adamson. Readers fall in love with Elsa, a lioness that was adopted by humans when she was an orphaned cub. Travels with Lisbeth (1993), a nonfiction work by Lars Eighner. Eighner shares a provocative autobiographical tale of homelessness for man and pet. Marley and Me: Life and Love with the World's Worst Dog (2005), a nonfiction book by John Grogan. Grogan's nonfiction account of his family's life with Marley humorously describes antic after antic of the lovable, troublesome, hyperactive dog. Travels with Charley (1961), a memoir by John Steinbeck. This memoir recounts Steinbeck's drive through America with Charley, his poodle. Herriot’s books are largely autobiographical; although most place and character names are fictitious, they are based on real places and people. For example, master vet Donald Sinclair, Herriot’s first employer, inspired the protagonist for several of his books. Herriot’s works cover forty years of his life as a veterinarian in the uplands of Yorkshire, including his marriage to a farmer’s daughter and his military service in the Royal Air Force during World War II. His affection for the landscape, the rugged farming population, and his patients is apparent in all his books; the volumes are laced with humorous anecdotes of man and beast, often with himself as the target of the joke. Lasting Influence. Not only did Herriot reach readers all over the world with his chronicles of agricultural, medical, and veterinary industries, but his legacy lives on. His fame has fueled a thriving tourist economy in Thirsk, North Yorkshire, with such attractions as the World of James Herriot Museum, housed in the building of his vet practice. Though a few critics have found his books ‘‘rather lightweight stuff,’’ most reviewers have approved of them as warm, likable, inspirational stories of places where people take pleasure in hard work and simple living. Although the majority of Herriot’s tales may be heartwarming, they contain enough of the grim realities of farm life to avoid sentimentality. Most of all, the author’s affection for his subjects is clearly demonstrated, and several reviewers have concluded that in their sincere portrayal of a man who loves his chosen home and lifestyle, Herriot’s books have earned their popularity. Other Books in the Series. The popularity of All Creatures Great and Small prompted Herriot to continue in the same vein with All Things Bright and Beautiful. The New York Times Book Review’s Paul Showers described All Things Bright and Beautiful as ‘‘Herriot's enthusiastic endorsement of a simple, unpretentious lifestyle,’’ adding, ‘‘No wonder the earlier book was so popular. Here is a man who actually enjoys his work without worrying about the Protestant Ethic; he finds satisfaction in testing his skill against challenges of different kinds. Beyond that, he delights in the day-to-day process of living even when things aren’t going too well.’’ The Lord God Made Them All, the fourth in Herriot’s original tetralogy, ‘‘begins as if the others had never ended, the same way old friends meet again and talk, at once forgetting they have been apart,’’ Lola D. Gillebaard remarked in the The Los Angeles Times Book Review. 1. Find the hymn from which Herriot took the titles of All Creatures Great and Small, All Things Bright and Beautiful, All Things Wise and Wonderful, and The Lord God Made Them All. Why do you think Herriot chose this particular hymn as his inspiration? Think of another hymn or song that you would use if you were Herriot writing those works today. 2. Much of today’s television programming consists of reality-based shows. With this in mind, Discuss the medical emergencies that form the conflict of some of Herriot’s most intense scenes. Do you think his particular veterinary experiences and outlook on life would make for good reality television? 3. Research the career of a veterinarian. Prepare a presentation showing your findings. Be sure to include information about the education needed to pursue this profession, common duties associated with the job, and different fields or branches within the profession. Brunsdale, Mitzi. James Herriot. New York: Twayne, 1997. Herriot, James. James Herriot’s Yorkshire. New York: St. Martin’s Press, 1999. St. James Guide to Young Adult Writers, 2nd ed. Detroit: St. James Press, 1999. Adams, Phoebe. Atlantic Monthly (August 1974); (October 1974). Collison, Cathy. Detroit Free Press (September 28, 1992); (February 24, 1995). Doener, William E. Time (February 19, 1973); (June 29, 1981); (July 7, 1986): 60; (July 18, 1994). Dowling, Claudia Glenn. Life (March 1988): 66-69. Gilleboard, Lola D. Los Angeles Times Book Review (June 7, 1984): 4. Gonzalez, Arturo F. Saturday Review (May-June 1986). Grossman, Mary Ann. Chicago Tribune. Foster, William. Scotsman (October 16, 1981). McCaig, Donald. Washington Post Book World (June 21, 1981): 11; (May 25, 1988): 4. Miles, Jack. Los Angeles Times (December 26, 1986). Showers, Paul. New York Times Book Review (February 18, 1973; November 3, 1974; September 18, 1977). All Things James Herriot. Retrieved February 14, 2008, from http://www.jamesherriot.org. WAGG. The World of James Herriot. Retrieved February 14, 2008, from http://www.worldofjamesherriot.org.